Lumiram is still around today, lol. Nice lamp! Looks a bit like the Philips Westinghouse 5000K Ultralume I have in a desk lamp. Unusual! Nice lamp! 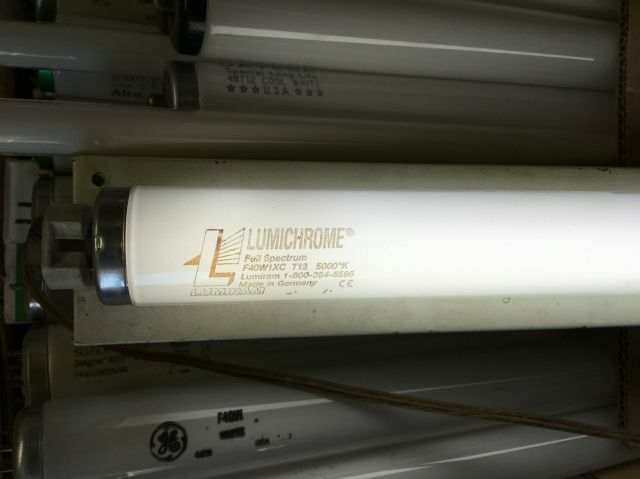 I have some 2 foot 17 watt Vi-Tek 93 lamps in daylight, but more like 6800 K, in my music room, gold colored bases, 40,000 rated hours if I remember right, made in Germany, and beautiful, BRIGHT, and super high color rendering (93!) and the best visual clarity on printed matter I have ever seen from ANY light source! I have one in a F20T12 preheat unit and it works like a charm in it, even though overdriven, it works beautiful on preheat! This lamp seems similar in 5000K--it must e LUSH! Rick D! Wow, those sound like cool lamps! My favorite/best would be Vita-Lite but I haven't seen as many cool things as you guys have in person LOL, being a millenial and an entry-level collector at that. I love the Vita-Lite too! Used to see lots of these growing up.